OK, it’s a great problem to have income over the retirement plan limits, but where do they save it? Logically, they should be setting aside a similar percentage of pay over the limit as they are under the limit, and most are smart enough to realize this. The question becomes, where can they place these additional funds without sending an inordinate amount of both growth and distribution to the United States Treasury? This money usually ends up in taxable mutual fund investments, which trigger a broad array of tax consequences along the way to retirement. A review of your personal mutual fund statement will confirm the combination of ordinary income and capital gains taxes due along the journey, not to mention taxes triggered by annual rebalancing. Spoiler alert – additional taxes are due upon distribution from funds when you retire (or need access to the money for important life events). This erosion makes the model inefficient for funds that the executive has earmarked for long term savings and retirement. One potential solution is to design a non-qualified arrangement to house after-tax contributions, protecting both growth and distribution from taxation going forward. There is a cost to create this vehicle, but it is a fraction of the taxes one would pay outside this protective shell. The executive can thus capture the delta between the cost of the program and the taxes he or she would have paid, allowing this differential to compound in their account over the years instead of sending it off to the IRS in annual installments. Distributions can be tax free. 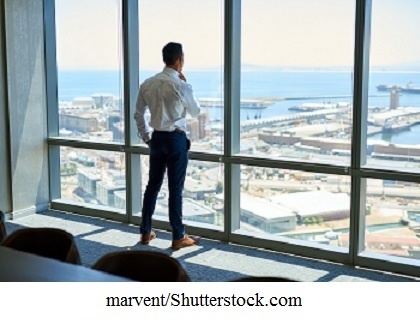 Blue chip companies have used this approach for decades to fund supplemental retirement and deferred compensation arrangements for their highly paid senior executive teams. MKA can make the same institutional platforms used by these multi-national giants available to smaller organizations and even individuals. The exhibit below illustrates the difference in net after tax rates of return inside and outside the plan, all other factors being equal. 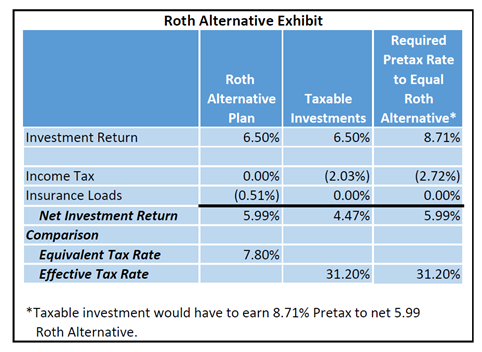 Because this approach results in Roth-like taxation, but without the restrictions or income limits, some are calling it the “Roth Alternative Plan”. This program can be an effective addition as either an employer sponsored benefit opportunity or as a plan that the executive establishes outside the employer as an individual. In either event, your senior team will greatly appreciate your shedding some light on both their retirement savings problem and this highly effective solution. If you would like more information on this subject, or have a client who might benefit from a discussion about it, please contact Dennis Sexton at dsexton@mkaplanners.com (781) 939-6060 or Barry Koslow at bkoslow@mkaplanners.com 781-939-6050. ©2017 MKA Executive Planners, 12 Gill Street, Suite 5600, Woburn, MA 01801 800-332-2115. All rights reserved.